Laurent Brossoit is 6' 3 and weighs 200 pounds. He is currently 26.1 years old. 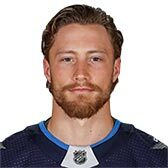 Has signed a one-year contract with the Winnipeg Jets.